I’m coming back with a bang! The kitchen is mostly done but completely functional, and this is the best thing I have ever made. I was trying to judge whether that’s an exaggeration, but I actually don’t think I say it a lot. So please, please try this. 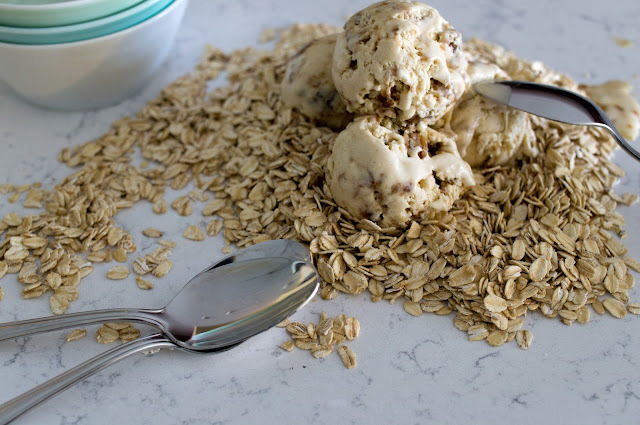 It’s basically an oatmeal cookie in ice cream form. The idea came to me when we were eating ice cream one day (duh) and wondering why they have chocolate chip cookie dough, cookies and cream, but nothing oatmeal cookie-like. Clearly an oversight. I later found out that Ben & Jerry’s used to have an oatmeal cookie chunk flavour that many people still seem to miss. So this one’s especially for you, ice-cream missing internet friends! 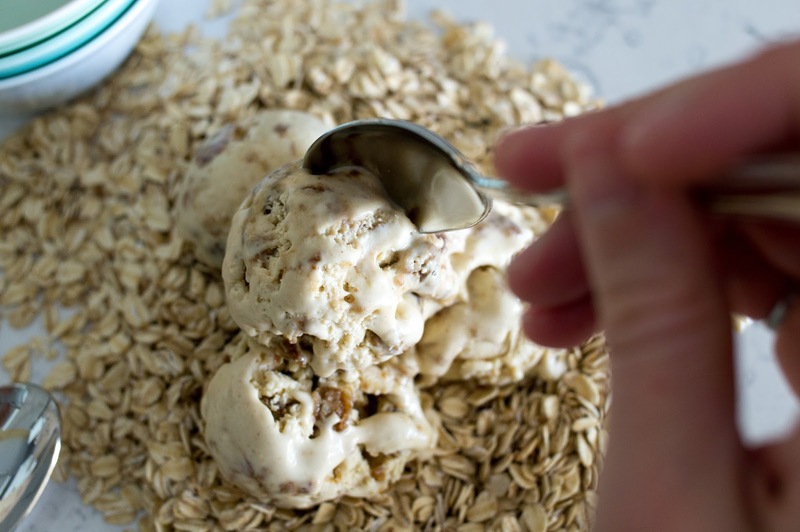 You might think you can just take vanilla ice cream, crush up some oatmeal cookies and voila. And you can. But this is so much more than that! 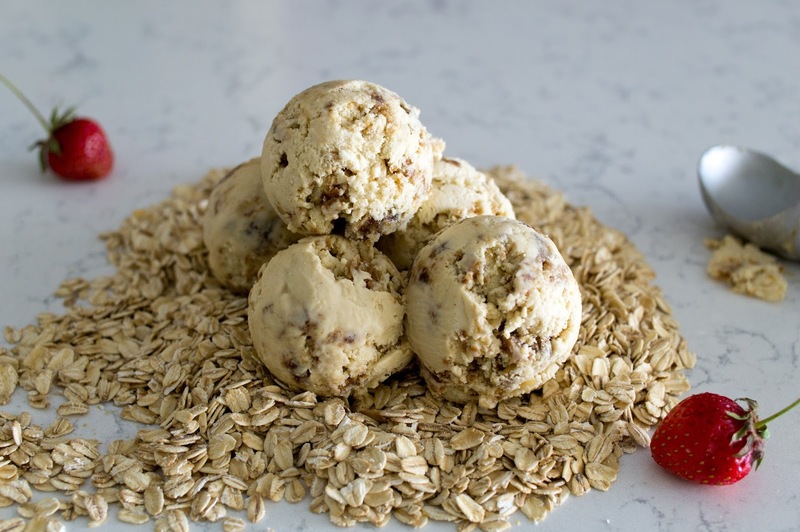 This version has a base that tastes like an oatmeal cookie AND oatmeal cookie chunks in it. The base uses oats soaked in milk, brown sugar, and cinnamon. 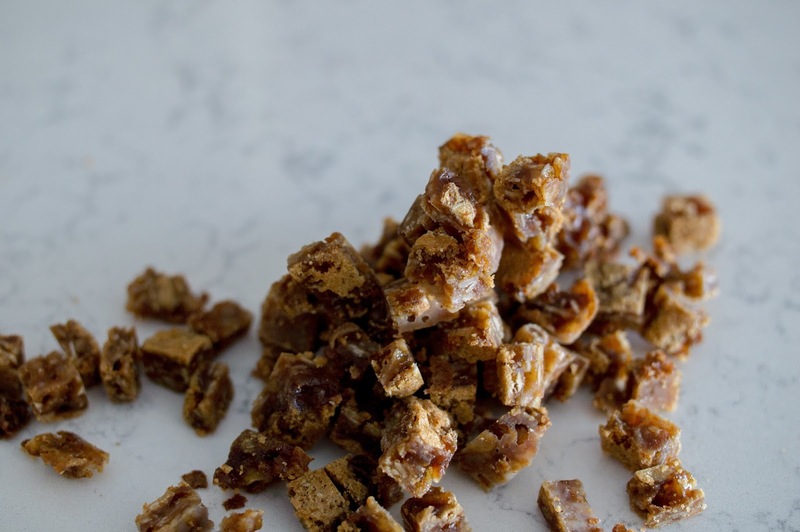 The cookie chunks are made special so that they’re still deliciously chewy even when frozen. This is important to avoid broken teeth. And because you’re doing it yourself, you can totally overload on cookie chunks! 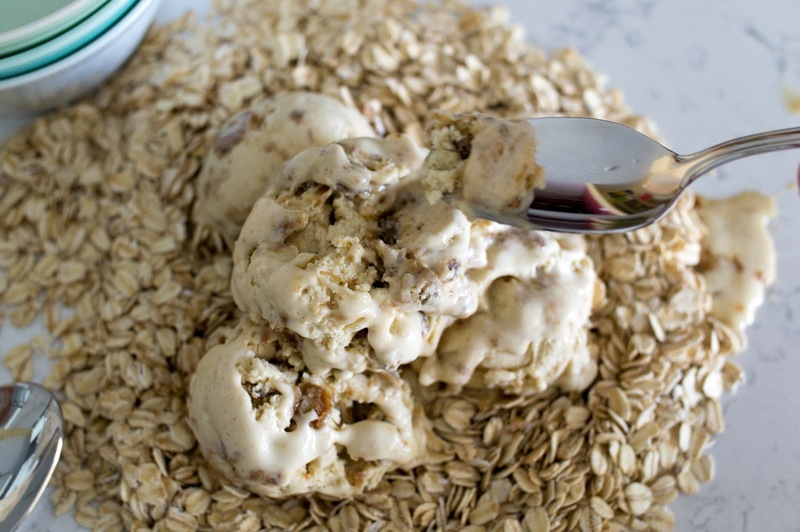 It can basically be ice cream covered oatmeal cookies. Or you can skimp on cookie chunks and eat them as a delicious frozen snack. They are seriously easy to pop. Whatever path you choose, it’ll be the most delicious thing you’ve ever tasted! Line a 9x13 inch pan with parchment paper so that it goes partway up the sides. Preheat oven to 350F. In a stand mixer on medium speed, cream butter and sugar until light and fluffy. Beat in egg and vanilla. Scrape down sides of bowl and add baking soda, salt, cinnamon, and flour. Blend on low speed until combined. Add oats and blend to combine. The dough will be quite soft. That’s ok. Spread the dough relatively evenly in the parchment lined pan. Don’t worry if you can’t get it all the way to the sides, it will spread while baking. Bake in the centre of the preheated oven for 16-19 minutes or until bubbly and brown on top. It will still be quite soft and jiggle a little when shaken. Let cool on a rack to room temperature, then freeze. Once frozen, cut into small squares (I did about 1 cm square). Keep frozen until ready to use. Try not to eat them all. In a small saucepan over medium heat, combine milk, oats, brown sugar, cinnamon, and salt. Bring just to a boil. Remove from heat, cover, and let soak for 10 minutes. Transfer to a blender and blend until smooth. Strain through a fine mesh strainer, pressing to get all the liquid out of the leftover oat mush. It may be quite thick and goopy. That’s normal. Discard (or eat, I won’t judge) oat mush. Set up an ice bath and place a large bowl with 1 cup of the cream in the ice bath. Set a fine strainer over top. In a medium bowl, whisk egg yolks and set aside. In a medium saucepan, warm the remaining 1 cup of whipping cream over medium heat until just simmering. Whisking the yolks constantly, pour hot cream in a thin stream into egg yolks. Pour mixture back into saucepan and stir constantly until thickened. It should coat the back of a spoon. Remove from heat and stir in the strained oat milk mixture. Strain everything into the cold cream over the ice bath. Stir in vanilla. Stir constantly over the ice bath until the mixture is cool. Chill in the refrigerator until completely cold, at least 4 hours or overnight. Churn according to your ice cream machine instructions. Stir in cookie chunks to taste (I probably used about 2 cups). Freeze.